When choosing a video solution, a good balance must be found between benefits and costs. Expert advice and support for system integration are equally important as seamless coverage and high image quality. engelbert strauss is a leading brand manufacturer of stylish workwear and protective equipment. Based in Biebergemünd near Frankfurt, Germany, this owner-managed, family run company employs around 1,000 workers. engelbert strauss has eight subsidiaries throughout Europe and also serves a large number of international clients directly from its' company premises in the Rhine-Main area. It distributes its range online, through catalogues and in separate workwear stores. 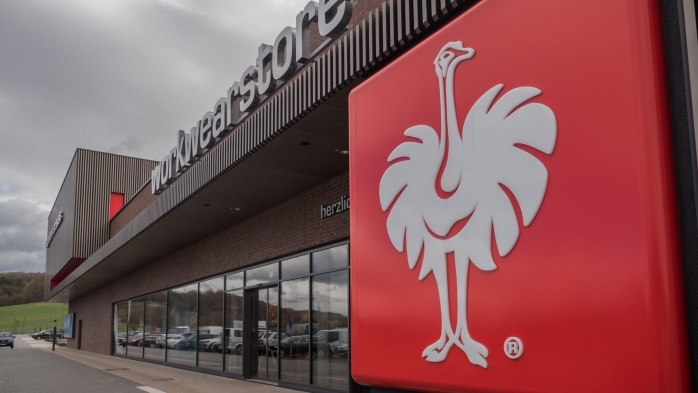 In October 2014, the company opened its newest and largest workwearstore® at its base in Biebergemünd. In order to protect this store and the surrounding property against break-ins, theft and vandalism – as well as to collect anonymous statistics on customer behaviour patterns – engelbert strauss has opted for high-quality video solutions from Panasonic. engelbert strauss requested the established market players to present their entire range of solutions. During the test phase, Panasonic's staff provided comprehensive support for its equipment. In addition to providing protection for the store and surrounding area, engelbert strauss also attaches great importance to having a solution that requires as little maintenance and installation effort as possible. In addition, it needs to be a high-quality solution with little risk of failure. At engelbert strauss's request, Panasonic installed high-quality cameras that blend into the environment and guarantee “seamless and aesthetically pleasing integration into the overall architecture”. The fence around the building is protected along its entire length by 18.5 mm Panasonic thermal imaging cameras with a range of 250m and integrated video motion detection. The Panasonic thermal imaging cameras have a spectral sensitivity rating of 8 μm to 14 μm, enabling a high level of detail and reliable detection of intruders regardless of the time of day or the weather conditions. The thermal imaging cameras are linked to four Full HD PTZ Dome cameras. Once alerted by the thermal imaging cameras, the dome cameras continue to track targets independently – their 30x optical zoom permits detection of even the smallest objects across the entire company site. The self-cleaning coated dome of the WV-SW598 PTZ Dome is a further major advantage, dramatically reducing maintenance costs. Surveillance in the underground car park focuses on ensuring the safety of company personnel as they leave the building. When monitoring customer parking, the emphasis is on preventing hit-and-run accidents and being able to establish the causes of dents and bumps to cars. In these scenarios, image capture is made challenging for cameras by various types of weather as well as adverse lighting conditions, backlighting and glare from headlights. This is why WV-SW458 360° cameras have been installed in the underground car park, delivering 1080p Full HD image quality while enclosed in a vandal resistant housing. For the access roads, WV-SW316L HD Bullet cameras were chosen. Featuring integrated IR lighting, these cameras ensure that arriving and departing vehicles can be monitored even in difficult lighting conditions. Inside the store, goods and customers must be protected against theft and assaults. In order to do this, the entire store has been equipped with WV-SF438 360° cameras. Thanks to built-in distortion correction and processing by the management software, the entire video image is always recorded. If necessary, however, it can still be viewed as a distorted image later on. The cameras are installed on a special crossbeam solution that allows them to monitor the entire store despite its overall visual layout. The checkout area is separately equipped with WV-SF138 wide-angle cameras that boast excellent distortion correction. Security, however, was not the only consideration for this project. Panasonic also helped engelbert strauss to develop and implement a statistical analysis of customer behaviour. This is based around an internal application that can be integrated into the merchandise management system. Customer movement patterns are recorded for optimisation of product presentation. For this, two WV-SP306 Box cameras with 125mm lenses have been installed in the entrance area to the store. The Wide Dynamic Range and ABS (Adaptive Black Stretch) technologies provided by the WV-SP306 guarantee a wider dynamic range than conventional cameras. engelbert strauss is extremely satisfied with the analysis methodology of the cameras and the statistics they help to deliver. All video images, from both inside and outside the building, are sent to a control room equipped with WJ-NV200/6TB recorders. The control room also houses additional hardware and software tools that support the surveillance activities: the WV-ASM200 client management software for LAN/WAN-IP solutions, the WV-ASE201 security extension software with map display and multi-monitor functionality, and the ethernet system controller with separate joystick. Due to the positive experiences with Panasonic's products and service, engelbert strauss is seriously considering the commissioning of follow on projects. Copyright © 2019 Panasonic France. Tous droits réservés.